Although historian Reinhart Koselleck did not directly quote Bloch’s concept of nonsynchronism, it is evident that he was familiar with his writings, moreover he knew Bloch personally, and in many aspects, their research interests were similar. Koselleck had been concerned with the problem of historical time since the 1970s. According to his views, everyone, in their own contemporaneity, relate differently to the past and their experiences (Erfahrung) define their expectations (Erwartung) and these guide their actions. “Experience is present past, whose events have been incorporated and can be remembered. Within experience a rational reworking is included, together with unconscious modes of conduct which do not have to be present in awareness. There, is also an element of alien experience contained and preserved in experience conveyed by generations or institutions . . . Similarly with expectation: at once person-specific and interpersonal, expectation also takes place in the today; it is the future made present; it directs itself to the not-yet, to the nonexperienced, to that which is to be revealed.” However, experience is manifold: it can be primary (personal experience of the individual) and secondary, that is, mediated experience. The spaces of experience (Erfahrungsraum) are fragmented, thus, people who live during the same time do have collective experiences, but these are differentiated by communities, generations, and individuals. This also means, according to Koselleck, that postulating collective memory and experience is questionable at the very least. There can be significant differences in experience, especially between generations, even in the same, real space, (such as the same city) and also in the same socio-cultural environment. Koselleck’s understanding about generations is close to Karl Mannheim’s theses of The Problem of Generations, published in 1928, as well as to Mannheim’s subsequent writings on generations. Mannheim defines generation as a “particular unity of spiritual and intellectual contents,” a community of empiricism and experience, which is determined by, among others, the socio-economic milieu. Mannheim, contrary to the Marxist , class conflict-based understanding of society, set up in his book an alternative model, according to which, several opposing “political” generations compete for the interpretation of reality in a given space and time. The concept of ‘political generation’ can be applied to the art field, as well, if the subject of examination is the conflict of opposing art concepts, the competition for institutional representation, or the interrelations of art trends in the polarization along different generations. However, the focus of Mannheim’s reflection on the generation is not only conflict, but also the question of knowledge transmission as a generational task: the concurrent necessity of “continuity and entrust” and its impossibility, as a next generation is moves away and separates form the previous generation’s experience. He believes that the transmitted knowledge this way carries different contents in each generation—and it is also true for the generations of artists. As might be expected, the works of Bloch, Koselleck, or Mannheim are not independent from their generational experiences, their essays were written with the desire to interpret the past and the present, and aimed to formulate the mission of their generations, they sought self-reflection. Mannheim’s concept of ‘generation’ was influenced by the Sunday Circle (Varárnapi Kör) and the Free School of the Human Sciences (Szellemi Tudományok Szabadiskolája)—a self-organized study circle of leading intellectuals in Budapest—that defined the beginning of his career in 1910s. Many of Bloch’s theoretical works were propelled by the challenges of Nazism, while those of Koscellek by the pressure to process the Nationalist Socialist past. In the 1960s, the reprint of Bloch’s works proved to be a fertile ground: it coincided with the aspiration of the 1968 generation to face the legacy of their predecessors. Mannheim’s model likewise became relevant around 1968, when both in the capitalist and socialist states the young generation emerged with a program that questioned the past interpretations of political and social sciences. Finally, on the 1968 Left, the generational model of Mannheim was forced out by Marxists class theory, and the question of responsibility slipped away: in this Marxist interpretive field, Nazism—and with it, the older generation who wished to forget the past—were no longer the ones to be held accountable, but rather the consequences of capitalism—dictatorship, and ultimately the war that was started by Germany—were to be blamed. Those who did not find this offered Leftist interpretation acceptable, such as Koselleck, their mode of conceptualizing ways to think about the past was characterized by both confrontation and isolation from the collective. Bloch became known in Hungary in the end of the 1960s, and became an important source of inspiration of the particular Marxism of the New Left in Hungary. While between 1951 and 1967, György Lukács meant an alternative to party politics with his criticism of personal cult, as well as foregrounding high realism instead of Socialist Realism, Bloch’s works, formed the basis for critiquing the increasingly bureaucratic and totalitarian socialism, particularly with his ‘concrete utopia’ concept, an understanding of the future that ushers in a new quality. At the same time when Lukács’s aesthetic started to become canonized in Hungary in 1969, Bloch was presented in the Hungarian press as the romantic hero of the ethical Leftis of Western European youth and bourgeois intellectuals. The initial friendship of Bloch and Lukács ended because of their different views on Expressionism: Bloch considered it to be a way to express the rationally indecipherable future-visions while, for Lukács, it was as mere mess..“If Marxism is no abyss, it still does not lack ‘depth’; so it is no help to dispel the fear of chaos with the pathos of shallowness.” – Bloch wrote in the Heritage of Our Time. At the summer university of Korcula, Bloch got personally acquainted both with the Western and the Eastern European New Left. In Hungarian art history writing it was Lajos Németh who attempted to connect artistic tendencies with theories about generations. In his book entitled Modern Hunagrian Art (Modern magyar művészet) published in 1968, he registered the appearance of three generations in the past two decades. Later, in 1973, art historiographical essay, he delineated the theoretical question of generations in relation to the concept of art historical eras. Following basically the thoughts of Mannheim, he introduced the views of philosopher Wilhelm Dilthey and art historian Wilhelm Pinder and their conclusions that taking into consideration the different time experiences of generations overrides the hypothesis of a unified style: thus, the chronology of style is polyphonic. Németh accepted in his writing Mannheim’s generation concept that presupposes the possibility of different ways of experiencing and thinking, which is defined by the particular historical-societal conditions. Moreover, he found them valid even in the case of fine art. Németh emphasized, however, that one cannot speak about collective goals in the case of every epoch and biological generation, and even though he admitted that generational changes were important elements in the dynamics of progress, he described it only as one element of the artists field, in its Marxist interpretation, which supersedes the concept of the generational style period. Analyzing parallel artistic processes, he inevitably arrived to the interpretation of historical time and period. In a much later article, evaluating the 1970s, he writes, “Every artificial structuring of historical time, i.e. the projection of processes of time into space, includes inevitably the danger arbitrariness, yet the premise of scientific research is the interruption of the temporal process, the exploration of synchronous connections.” The exhibition 1971–Parallel Nonsnychronism—relying on the above- described theories interpreting historical time—aims to display the synchronous processes of one year, as a point of departure, and moving back and forth, of a roughly five-year long period. The starting points of the exhibition are two contemporaneous bodies of artworks, and through which it analyzes artistic phenomena during the so-called Kádár era (1957–1989) that were parallel yet connected to different timelines. The exhibition does not offer a narration characteristic of modern art museums, in which a linear historical time is displayed in chronological order, and it does not wish to substantiate the ideas of linear progress of modern art; it rather endeavors to present micro histories of parallel phenomena. It examines the complex relationships of two defining generations of artists, without giving aesthetic or historical judgment. The exhibition endeavors to reveal and present artworks and the contexts in which they were produced: the complex relationship between state power and art. The date is 1971, and based on this, the a broadly understood period between 1968 and 1973, a time in which the historical “force coefficients” were partly similar: the atmosphere of a major economic reform initiated in socialist Hungary and the cultural policies that saw and wanted Hungary to be seen as a proponent of modernity, but had a still vacillating position regarding the latest trends in then contemporary art. In the exhibition, two generations appear with numerous demonstrable connections, but their experiences, their horizons of expectations, and their artistic utopias are different. In some cases, they are in master-apprentice relations; their relationship illustrates the generational model of Mannheim with regards to the limitations of the transmission of knowledge, and the competition for institutionalization. One of the generations emerged between the two World Wars, who followed different artistic tendencies, and could successfully adapt to the demands of Socialist Realism in the 1950s, and at, the end of the decade modernized their art forms by returning their modernist roots of the prewar period. Their prestigious social status was indicated by professorial positions, state commissions, works that were purchased by museums, monumental artworks. At this point, their story connects to the museum organizing this exhibition. The Budapest History Museum, the parent institution of the Kiscell Museum – Municipal Gallery opened in Buda Castle as the first cultural institution in 1967. In the spring of 1971, it hosted the exhibitions of Gyula Hincz (1904–1986) and József Somogyi (1916–1993), and in the autumn, the exhibition of Endre Domanovszky (1907–1974). According to the original plan, Jenő Kerényi’s sculptures were going to be exhibited alongside Endre Domanovszky’s paintings, which, however, did not come about. The significance of these events, in terms of cultural policy, is underlined by the fact that the artworks that were presented to the public in this symbolic place, in the newly opened Buda Castle building’s modern, rebuilt interiors—which were to abolish the memories of the past—were in fact the pieces that represented Hungary at the Venice Biennale, that is, artworks that were presented to an international audience as the epitome of Hungarian modern art. In the spring of 1971, the exhibitions of artists Gyula Hincz and József Somogyi came directly from the Venice Biennale of 1970, and in the autumn, the retrospective exhibition of Endre Domanovszky was the quasi-rehearsal for the artist’s participation in the 1972 Venice Biennale. Lajos Németh was the supporting art historian behind them. Their works are on view in the Temple space in the chapter entitled Museum. The other group of works displayed in the Oratory, connects the so-called second public sphere—which was beginning to take shape around this time—and a much younger generation. Members of the artist generation, surfacing at the end of the 1960s, could not present their works in public, state-supported fora, or only to a limited degree. Although they made several, unsuccessful attempts to find their ways into the state-run institutions, finally they established their own semi-public institutions. One of these, today almost forgotten, but not less memorable experiments, is related to the action of László Beke in 1971 titled Imagination. In 1971, Beke sent a call for participation to submit artworks that document ideas to 28 young artists, to those who had, in the preceding years, come up with a program aimed at transgressing the traditional genres of fine art. The action was motivated by an art historical interest and the intention to archive new tendencies in contemporary art and visual culture, which whished to directly documented artistic thinking and utopian imagination, putting aside the question of practical implementation. It was only later that both Beke and the participants realized that the submitted works belonged to the international Conceptual art movement. 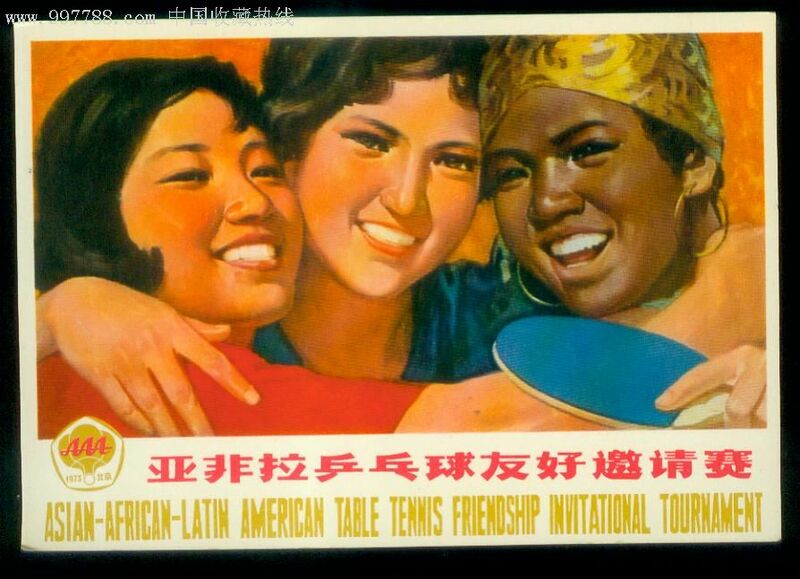 Beke’s action was created at a moment in time when the cultural policy perception of this new trend and its representatives was still uncertain, there were opponents, but also supporters. Still, it was an optimistic, a rather bold venture that the art historian of the King Stephen Museum in Székesferhéráv, Márta Kovalovszky, in cooperation with Beke, planned a museum presentation based on a similar concept at the end of 1971. Although the exhibition could not be realized, due to the intervention of the Lectorate of Fine Art and Applied Art, the invited artists had in the meantime submitted their works to be presented at the exhibition and in its catalog, for which László Beke also wrote a foreword. Thus, the material preserved in the museum’s archive, and presented for the first time in this exhibition, is an important document of concrete utopias that go beyond the frameworks of the present, but which, at the same time, strive for realization and engage in a debate for the interpretation of reality. This shows that while the generation that appeared in the second half of the 1960s formed its own parallel, self-organized institutions—like the Chapel Studio of artist György Galántai—and the “escape ways” through applied arts and community culture, still had hope until the beginning of to the 1970s and conquer and to reform art institutions. The political turn in the beginning of the 1970s, however, declared as the representatives of modernity the progressive artists of the 1950s, the moderately modern masters committed to political representation, who replaced g Socialist Realism with the high realism ideal of Lukács, instead of the artists of the 1968 generation, who radically reformed the language of art and whose work was in sync with international tendencies. The curators of the exhibition chose different micro-historical focuses and close-ups, but there is also a “grand total.” Carlo Ginzburg, the most acknowledged representative of microhistory writing, mentions in several of his historiographical essays the works of Siegfried Kracauer, one of the most significant authors of the Frankfurt School, which even though no influence on formulating his own method of historical writing, but later, when he learned more about them, , he could read into them his aspirations for historians Kracauer who, together with, among others, Ernst Bloch author worked for the Frankfurter Zeitung before the Nazi takeover, in his later works written during his emigration discussed the relations of micro- and macrohistories. In his 1969, posthumously published book, History, the Last Things Before the Last, he drew a parallel between the historiographical representation of fundamentally discontinuous and heterogeneous reality and the blow ups in film. . As a result of the simultaneous application of the close-up and the grand total, and of the micro- and microhistories, an overallvision is created on the one hand, , and on the other hand, its continuous renegotiation also becomes possible. In our exhibition, inspired by the texts of Ginzburg and Kracauer, the two above described microhistories are connected with a “wider long shot:” the Context section outlines the complicated web of relations and overlaps. In this period, which can be well defined both in terms of time and of thepublicness of the artistic work, (the period of the New Economic Mechanism, from the first Iparterv exhibition in 1968 to the prohibition of the events in the Chapel Studio in Balatonboglár in 1973), the boundaries are hard to feel, the changing conditions and positions are defined by political and economicl processes, as well as personal decisions, Thus, ehe simultaneous application of the close up and the long shot is warranted. The introductiory texts in the Context section present the economic, international and domestic characteristics of the period between 1968 and 1973. Institutions, places, events governed by cultural policy are introduced through artworks, archival films, tableaus, and documents. 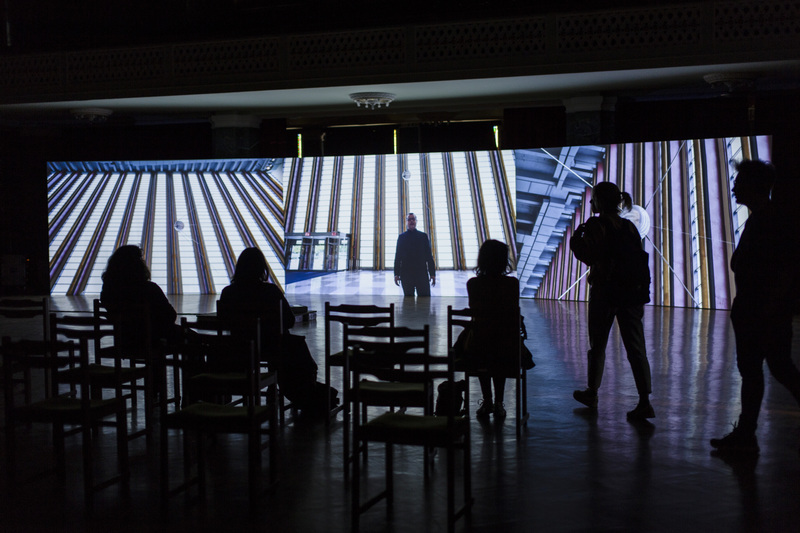 The section in the Tower space, entitled Retrospection presents Hungarian documentary films that first attempted—between the mid-1980s to the end of the 1990s—to recounts important events of the period presented in the Context part. In each section, the arrows, next to the titles, that point in different directions, which signify the different approaches (microhistory, long shot), were created by the graphic designers of de_form studio. The notice board-like presentation in the Context section, also based on the design by the de_form studio, refers to the educational role of the museum. Likewise, notice boards were characteristic of this era for transmitting information and it is similar the artistic practice of Tamás Kaszás, the cooperating artist in the exhibition, who used this kind of presentation in his earlier installations. Kaszás with two new works he produced for the exhibition introduced further levels of reality. The structure entitled Cabinet ’71, displayed in the Museum section, puts the works displayed inside it in quotation marks, provides a new framework of interpretation, and alludes to the position of art and artists and works fulfilling state commissions. In the four corners of the box-like space, the texts on the information stands, approach the exhibited material from four different perspectives, and the visitor can choose: the works in the Museum section can be interpreted with; however, reading through all of them might offer a a complex web of meanings. 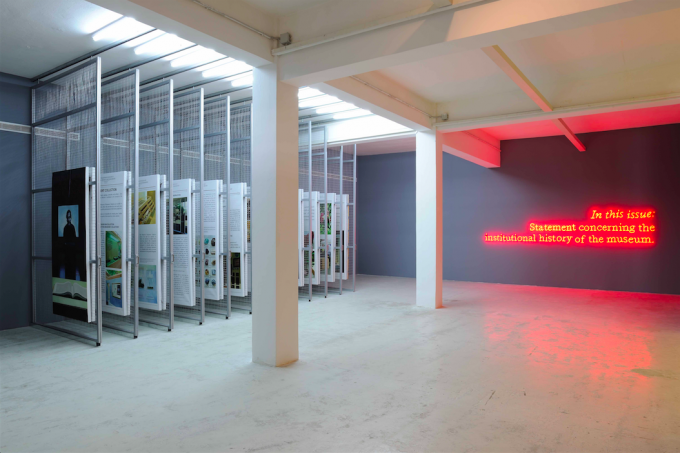 It was a definite curatorial intention that the exhibition should not provide a one-way, telelogical narrative, but would undertake and express the possibility of multiple readings, with the help of texts, films, and the display itself, to contribute to the perception and interpretation of complicated net-like relations. This is why the exhibition can be entered from both directions, from the Temple space and the Oratory. The exhibition does not hierarchize, the sections meet from different directions and connect to each other. The work Space Grid by Tamás Kaszás, placed in the courtyard of the Museum, deals with the possibility of the realization of one of Dezső Korniss’s (1908-1984) designs submitted on graph paper for the Imagination project. Korniss was a representative of the classical Avant-garde, which was marginalized from the 1950s. Even though he belonged to the older generation, from the end of the 1960s he connected with the younger artists as a chosen master and participant and organizer of semi-public exhibitions. The fact that Korniss volunteered to participate in Beke’s projectshows shows how Korniss was a point of connection between two generations. In Tamás Kaszás’s work, the design of Korniss can be seen one step before its full execution, built in 1:1 ration with formwork, and laid on the ground, which highlights even more the fundamental question of conceptual art: what is a work of art? Is it the utopian idea, or a tangible, realized work that is burdened by compromises? The dialectical relationship between these two categories is exemplified by the objects in the Between Genres section of the Oratory, which relate to the concepts in the Imagination project. Here not only subsequently “realized” concepts can be seen but formerly created works, or the documentation of carried out actions as well, which were often the starting points of the ideas the artists sent to Beke. In the Oratory, the sheets documenting the imaginations ideas are displayed between Plexiglas panels, following the design originally made by the Czech artist Zbyněk Baladran for an exhibition in Prague, and are hung in the space, referring concurrently to provisional status of an idea between immaterial concept, exhibited work, and searchable documentation, and to the status of the new Avant-garde sought to appear in an institutional context, yet was forced to appear in provisional, spaces, and thus was relegated to second public sphere for a long time. In any case, the two groups of artworks, based on generational differences, the highlights of the oeuvres, linear progression narrative of modernism that presupposes, progression, may appear to the succeeding generations as if they were created in two entirely different times. As is the art of Domanovszky/Hincz/Somogyi/(Kerényi) was part of the 1950s, and the Imagination of the 1970s, while the events were simultaneous. As if—as Bloch writes – they were not in the same now: one of them points toward the past, the other to the future. Displaying the Imagination project and a chapter from the exhibition and collection history of the Kiscell Museum – Municipal Gallery in the same building and at the same time, in two venues, is the museological representation of the phenomenon parallel nonsynchronism This approach draws attention to phenomena which took place simultaneously but bifurcated later in historical memory. The exhibition project thus ultimately underlines the complexities of reconstructing the past. The example of Koselleck or Mannheim also shows that, in addition to the scientific discourses of the present, historiography is determined by the researchers’ own experiences: their choice of topics, the issues they raise, and the responses they give are not independent of their age. Thinking about the museum is influenced by contemporary processes as well. After the millennium, besides the neoliberal attitude in the international art field, that considers museum exhibitions to be economic enterprises, the so-called radical and/or critical museology emerged, which attempts to deal with and reinterpret the museum’s own past, while also reflecting on the societal problems of today. It considers the museum a critical agent that through its exhibitions and programs initiates enters into a dialogue with society, deconstructs systems of power and their related forms of thinking and, hence, it becomes an active participant in the process of building democracy. The question in fact is if a museum is capable to offer not only a range of objects, data, scientific results, or purely aesthetic experiences, but also to encourage visitors to change their viewpoints and revise their familiarized thinking schemes. Is the museum, which always replicates systems of power at given time, and participates in the process of spreading norms, hierarchies, and views of the past and the present, , an appropriate place to explore and present the elements of the systems of power, (including the museum itself) and their operating mechanisms? Numerous European examples prove that it is not an impossible mission, but but there is no doubt that such reconsideration and “unwinding” of the collection from the established framework puts curators and visitors at a difficult task .It encourages the viewer, instead of passive perception, by formulating questions, to engage in intellectual activity and thus in self-reflection. What could critical attitude mean in a Hungarian museum today? While public discourse and the public interpretation of the past are characterized by schematism and judgment, isn’t keeping a distance a critical attitude? The juxtaposition of phenomena, the presentation of the actors’ often changing positions and the complex web of reality? The two last exhibitions of the Kiscell Museum – The Municipal Gallery, Without index. Mr B.A. in X, 2016 and Separate Ways. Karl-Heinz Adler and Hungarian abstract art, 2017, –focused on the relationship between artists’ positions and state power, on the various advocacy strategies of intellectuals close to power in the period after the 1956 Hungarian Revolution. In both cases the attitude takes distance: it does not judge neither in aesthetic nor in political terms, but it tries to soften, to rectify dichotomies existing in (art) historical narratives and in personal accounts, which often adjusted, a posteriori, to the former. “Can the myth of resistance still be upheld?” – Art historian Edit András asks in her essay in the catalogue Without index, and she adds: the stigmatizing categorization projected to the past is often the projection of the impossibility of resistance in the present; that is, it realizes, rhetorically referring to the past, all that is impossible in the present. The current exhibition following, the methodologies of critical museology, attempts to interpret and rewrite these mechanisms, in a close-up of its subject, by pointing out malleable, changing, and complex relations, , while it connecting theirsignficance to the present. When actors of the contemporary cultural seem to recongnize in today’s cultural policy the at the reactivation of the “principle of “tolerated prohibited, and supported art” – and the dichotomy of the official/non-official art can be experienced again, then, behind the desire to understand the political games and the structures of the1960s and 1970s, lies obviously the need for self-analysis. The problem of artists appearing in institutions, or getting outside of them, the issue of creating alternative spaces, or the lack of institutional background and funding needed to create new art works inevitably makes the observer sensitive to the phenomena of the Kádár era. Despite all scientific correctness and distancing attitudes, the past and the present start to overlap, and as doublespeak, well-known for the generations before the regime change, becomes active again, the problems of the present get read into the codes of the past. However, the construction of direct analogies between the present and the past has the danger of losing the context and reproducing the dichotomies that are often arise from simplifications. The exhibition, by presenting the once opposing parties, the various compromises between the authorities and the individuals, the complexity of the relations to the political, power structures, of any time, rather encourages visitors to ask questions regarding their present and to reflect on their own positions. The museum as social institution, while speaking about the past, obviously talks tothe present, , which bears particular responsibility in this space. Nowadays, one can witness the process whereby critical thinking is forced out of the institutional system, partly for political, and partly for economic reasons, while self-reflection is part of the rethinking the role of the museum. The museum, by presenting its own history, examines the institutions created by cultural authorities, and ultimately its own the possibilities and limitations. When move of the Budapest History Museum into the Buda Castle in the late 1960s, and its exhibitions organized therein the early 1970s, , it is evident: behind the decisions regarding the Buda Castle were once—like today—ideological, political discourses, and state representational goals;, only the final outcome was in the opposite direction The utilization of the castle for cultural purposes was then, after 1956, a kind of democratic gesture, and it carried the promise of consolidation. However, its hypocrisy can be seen through precisely the history of the museum: almost right after the 1967 opening of the Castle, the ministry and the council took over the most representative exhibition space in in order to organize historical and art exhibition of national political significance. withe. The c acquisitions and the exhibitions of the Municipal Gallery were defined by the environment, certain actors’ embeddedness, within the institutional system, their relations to the elite in power. Consequently, until the end of the the 1970s, early 1980s artists of the second public sphere or the self-financed” sphere, became part of the collection only in very limited numbers. To fill in this hiatus was only possibly in the 1980s-1990s. Through mapping the provenance of the objects, the dark moments of an institution can also be tracked, as the blooming of the official Socialist Realism was followed by it devalution in the 1980s, as a consequence of which, the art objects themselves started to decay. For instance, one of Domanovszky’s tapstry, the Weaver, which was originally made for the museum, seems to have been lost forever. Hermann Bausinger, Ungleichzeitigkeiten. Von der Volkskunde zur empirischen Kulturwissenschaft. In: Helmut Berking, Richard Faber (Hrsg. ): Kultursoziologie. Würzburg 1989.„Párhuzamos különidejűségek”. [Parallel nonsynchronisms], Ethnographia. 100. (1989) 1-4, 24-37. Niklas Olsen: History in the Plural: An Introduction to the Work of Reinhart Koselleck. Berghan Books, New York, Oxford, 2012. 151-152. On the question of individual and collective remembrance see: Aleida Assmann [The new Uncanny in memory culture]Bp., 2016. 32-47. Vera Sparschuh: Mannheim Károly tanulmánya a generációk problémájáról ¬ műtörténeti és elméleti dimenziók. [Karl Mannheims essay on the problem of generations – art historical and theoretical dimensions] Világosság, 2007/7-8, 107-122. According to the remarks of Kurt H. Wolff in his work Soul and Culture, Mannhem “literally speaks as a member of a generation, as its spokesman,” Seele und Kultur. In: Karl Mannheim: Wissenssoziologie. Auswahl aus dem Werk eingeleitet und herausgegeben von Kurt H. Wolf. Berlin – Neuwied: Hermann Luchterhand Verlag, 1970. 12, mentioned in: Endre Roth: Mannheim Károly és a budapesti társadalomtudósok. [Karl Mannheim and the social scientists of Budapest] Világosság, 2007/7-8, 61. Németh Lajos: Modern magyar művészet. [Modern Hungarian Art in Hungary] Bp., 1968. 138. Claire Bishop: Radical Museology: Or What’s Contemporary in Museums of Contemporary Art?, Walther König, Köln, 2014; Piotr Piotrowski: Making the National Museum Critical. In: Katarzyna Murawska –Muthesius and Piotr Piotrowski (eds. ): From Museum Critique to the Critical Museum. Ashgate, London, 2015. 137-146. Zsuzsa László is a researcher at Artpool Art Research Center and is completing a PhD in Art Theory at the Eötvös Loránd University, Budapest. Between 2009 and 2018, she was researcher and curator at tranzit.hu. She has (co-)curated various tranzit.hu exhibition and publication projects, including: Art Always Has Its Consequences, 2008–2010; Parallel Chronologies 2009–; Regime Change—Incomplete Project, 2012; Sitting Together, 2016. She is member of the board of tranzit.hu and the editorial board of the online magazine Mezosfera. From 2008 to 2012, she was lecturer at the Intermedia Department of the Hungarian University of Fine Arts, and between 2005 and 2007, at the Institute for Art Theory and Media Studies, ELTE, Budapest. In her research and curatorial activities she explores transnational exhibition histories in relation to the concept of East European art in the Cold War era, and the interconnections of pedagogical practices, cultural and social history of the neo-avant-garde. Enikő Róka is an art historian, museologist, and researcher based in Budapest. She worked at the Hungarian National Gallery between 1996 and 2014, where she was the Head of the Collection of Prints and Drawings (2000–2009) and Head of Research (2010–2014). She wrote her dissertation about the history of a fin de siècle art collection. Specialist of 19th and 20th century art and architecture, she curated many exhibitions, such as Mihály Zichy, Gustave Doré. Deux “monstres de genie” (Musée Félicien Rops, Namur, 2009), XIX. Art and Nation. Image and Self-Image (Hungarian National Gallery, 2010), Art and Artists in the First World War (Balatonfüred, Vaszary villa, 2014). She published several essays about the relation between art and ideology, propaganda and nationalism in art. She has written two books, one about protestant church architecture (A budai református templom. Budapest, 1999) and another about the Ernst collection (Nacionalizmus és modernizmus. Ernst Lajos gyűjteménye és az Ernst Múzeum. L’Harmattan, Budapest, 2013). Since 2014, she is the Head of the Kiscell Museum – Municipal Gallery.